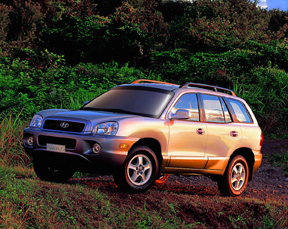 Hyundais Sante Fe has always been a nice SUV, but for 2004 the Korean carmaker has added really to that description. All it took was some tasteful upgrading of the interior and the addition of the running gear from the companys XG350 luxury sedan. Yep. This year, the Sante Fe is also available with that other cars very nice 3.5 liter six cylinder engine and five speed automatic transmission, along with assorted other interesting tweaks and wrinkles. The result is a really nice SUV thats quite gutsy, refined and comfortable. All for $33695 Canadian (about $24K US), about $3500 Cdn more than the top of the line Sante Fe with the normal 2.7 liter V6. For that money you not only get the big  and better  V6 with pretend manual Shiftronic automatic transmission, you also get just about all the creature comforts you could want, packed into a civilized vehicle that's really nice to drive. On the outside youd be hard pressed to notice the difference, other than the badge on its bum. The Sante Fe continues with the same overall look as before which, depending on whom you ask, is either RAV4-like or Armadillo-like and has the same rounded contours as the other Sante Fe models - contours that led a friend of mine to remark that it looked as if someone had kicked in the doors. Thats perhaps overstating the case, since its actually a reasonably handsome SUV, but to each his own. Not only that, but it seems as if Hyundai had been listening to critics (always a dangerous thing!) and has taken some of their criticisms (including my own) to heart. For example, I had previously whined that where the Sante Fe could use some work is in the little things, such as the buttons inside (particularly the door lock, power window, and cruise control buttons), which felt very cheap and offered little tactile feel. This still applies to some of the buttons, but the huge expanse of cheap-looking plastic on the dashboard has been broken up nicely and not only looks better but is actually more functional since you could actually toss small things onto the passenger sides recessed shelf-like area. And that alone is a huge improvement. On the other hand, the leather of the seats looked as if it had been skinned off of PVC cattle and the AM/FM/CD stereo is ergonomically frightening. But everything works fine, and overall this is a nicer vehicle than in previous years, so my complaints amount mostly to nit picking, especially considering the vehicle's price. The 3.5 liter V6 is rated at 200 horsepower @ 5,500 rpm and delivers 219 lb.-ft. of torque @ 3,500 rpm The powerplant features a cast-iron block and multi-valve aluminum cylinder heads. It gives plenty of oomph, dispensing confidence-inspiring power that gets you up to speed about as quickly as youd need it to. The 3.5 litre engine puts its power to the pavement through a 5-speed Shiftronic automatic transmission that works very well in automatic mode, though I found its pretend manual performance left something to be desired. In fact, while Im a sucker for a stick shift, I actually preferred leaving the Sante Fe in automatic unless I wanted to use engine braking on hills and the like. Then again, I never had a chance to try it on any interesting highways, due to inclement weather when I had the Sante Fe, so perhaps some nice and challenging twisty bits would have changed my mind. After all, I liked the same engine/transmission combination when I tried it on the XG350 during a spirited jaunt through the Rocky Mountains, though I had some complaints about its manual performance there, too. Besides that nice 3.5 liter engine, the Sante Fe boasts four wheel disc brakes enhanced with four channel ABS and they stopped well and true every time I tried them. Hyundai says its electronic AWD system was designed by Borg-Warner and features InterActive Torque Management. This means that when it senses slippage in the front wheels, it automatically transfers power to the rears. Then, when traction is restored to the fronts, power to the rears is reduced or eliminated. While this isnt exactly full time all wheel drive, it does offer a good balance between traction and fuel economy. Suspension is independent, double-wishbone in the rear with MacPherson struts with stabilizer bar up front. My test Sante Fe, like all of them, came with 4 wheel disc brakes. Sante Fe models wearing the GLS trim level come with standard ABS; traction control is only offered on the big model. GLS and 3.5 litre GLS Sante Fe also comes with an electronic brake force distribution system. The power-assisted rack and pinion steering offers good road feel. Wheels are 16 inch aluminum alloy models wearing P225/70R 16 tires. Inside, you get all the creature comforts you could want, including an automatic climate control system that works very well. The leather seats up front have bun warmers, everything youd want to have powered is powered (including keyless entry and power door locks) and one thing I really liked is the beautiful, huge sunroof. I would have liked it to have been an inch or two more forward, but that would have cut into the controls, lights, and sunglasses holder that are ceiling-mounted. By the way, wind noise at highway speeds is minimal; most impressive for a biggish vehicle such as this. The drivers seat features 8 way power adjustment and between it and the tilt (though not telescoping) steering wheel its easy to find a comfortable driving position. The front passenger seat has manual adjustment. Instrumentation is clear and straightforward and all controls are laid out logically and are close at hand. I had the same complaint with the Sante Fes stereo as I did with the 2004 Elantras, to wit the AM/FM single disc CD head unit is an ergonomic disaster and the overall audio quality is merely good. There are plenty of storage areas and cupholders (the rear seat cupholders are in the center arm rest). Safety features include dual front airbags, front seatbelt pretensioners with force limiters, crumple zones fore and aft, and rear kid safety door locks. My 3.5 liter GLS also came with side airbags. Besides the usual power windows, door locks, and heated power mirrors, other standard features on the 3.5 GLS include a roof rack, and a rear wiper and washer. You also get front fog lights, a retractable cargo cover, and chrome coated outside door handles. When I reviewed earlier Sante Fes I said they felt like first generation vehicles (which they were), and that they felt a little short on refinement. With a couple of minor exceptions (like the carryover plastic buttons) this 3.5 liter GLS doesnt feel that way.